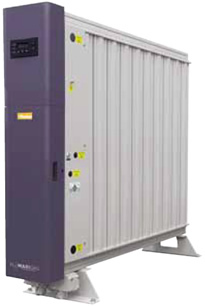 MAXIGAS nitrogen gas generators from Parker produce nitrogen gas from compressed air and offer a cost-effective, reliable and safe alternative to traditional nitrogen gas supplies such as cylinder or liquid. Nitrogen is used as a clean, dry, inert gas primarily for removing oxygen from products and/or processes. MAXIGAS provides an on-demand, continuous source of nitrogen gas which can be used in a wide range of industries such as food, beverage, pharmaceutical, laboratory, chemical, heat treatmen, electronics, transportation, oil and gas and laser cutting. 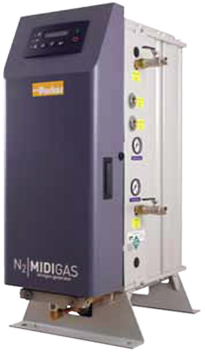 MIDIGAS nitrogen gas generators from Parker produce nitrogen gas from compressed air and offer a cost-effective, reliable and safe alternative to traditional nitrogen gas supplies such as cylinder or liquid. Nitrogen is used as a clean, dry, inert gas primarily for removing oxygen from products and/or processes. MIDIGAS provides an on-demand, continuous source of nitrogen gas which can be used in a wide range of industries such as food, beverage, pharmaceutical, laboratory, chemical, heat treatment, electronics, transportation, oil and gas and laser cutting. 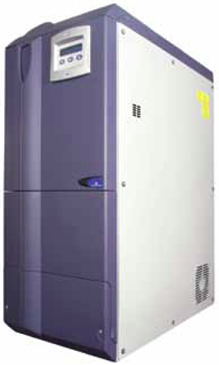 The Parker domnick hunter G1 and G2 nitrogen gas generators employ robust, field proven technology to produce ultra high purity nitrogen from critical life science, chemical analysis and spectroscopy applications. Flow rates range from 0.55 L/min to 3 L/min, with purities > 99.999%. The G1 and G2 generators provide a continuous stream of ultra high purity nitrogen from a single ‘plug and play’ unit. Models are available with and without an integral an oil free compressor, are extremely quiet in operation and are fully approved for use by major instrumentation manufacturers. Innovative design and technology facilitate maximum instrument uptime, attractive return on investment and proven alaytical performance, eliminating the need for other modes of supply. A range of tailored service contracts, extended warranties and global manufacturing capabilites provide comprehensive aftermarket support.